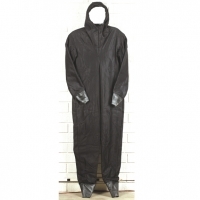 $96/DZ BLACK COVERALLS, MED AND LARGES, 2xl and 4 xl in stock, YOU CAN BUY LESS THAN A DOZEN. USE COMMENT BOX TO LET US KNOW HOW MANY AND WHAT SIZES. RUBBER ENDING AROUND ALL OPENINGS. large zipper going across the back to get in and out of the garment. use comment box at check out. FOR 20 DZ OR MORE 50 CENTS PRICE BREAK PER PIECE.